In 2010 a questionnaire was sent to every home and business in the parish of North Mymms. More than 4,000 documents had been printed. The aim was to gather feedback from local residents and those running commercial concerns about what needed to change in the local community. The findings were meant to form an action plan to shape the future of the parish. The North Mymms History Project (NMHP) has been looking at what was described at the time as an exercise in “taking the pulse” of the “village communities” in the parish in order to create “A vision for the future of our community”. Hertfordshire’s River Colne flows through the west of North Mymms. During certain conditions, when the swallow holes at Water End are saturated and a lake is formed, the overflow channel feeds the normally dry riverbed of the Colne. Malcolm Tomkins, a prolific local historian who died in 1981, wrote the following article about the river for the June 1966 edition of the Hertfordshire Countryside magazine. Local historian and photographer Mike Allen, one of the team of four behind the North Mymms History Project, has been researching the trig points and bench marks in the parish of North Mymms and exploring the importance of the landmarks in both wartime and peacetime. In edition 23 of Mike’s North Mymms Notes, he traces the history back to Tudor times. For approximately 30 years, a footbridge, privately built by Queenswood School, spanned Shepherds Way. The bridge provided a safe passage for pupils and staff from the school buildings on the south side of the road to the school playing fields on the north side. It was located near the current entrance to the car park. Today only the concrete foundations on the north side survive. Immediately to the north of the junction of Dixons Hill Close and Dixons Hill Road in Welham Green, North Mymms, is the site of a medieval moated homestead which archeologists have dated back to the 13th century. The moat, which is now partly infilled and built on, was examined almost 70 years ago when pottery and coins dating back to 1279 were found. The North Mymms History Project has been researching the moat’s history. The first telephone exchange to service the parish of North Mymms was opened by the National Telephone Company (NTC) just outside the parish boundary in a private house called ‘Shaldon’, 68 Hatfield Road, Potters Bar. It is not known exactly when the exchange was opened, although the 08 January 1907 issue of the ‘Post Office Circular’ records the exchange as being open at the time of publication. The parish of North Mymms has a surprisingly large number of bridges, many of which are at least 150 years old. Local historian and archivist Peter Miller has been researching local bridges and has produced the following report which includes all the major bridges that are approximately 100 years old or more. He has not included the more recent bridges over the A1M. The oil painting to the left is dated 1909, and is believed to be the only known image of a pair of cottages that once stood on the south side of Hawkshead Lane to the east of the railway line next to where Hawkshead Bridge is today. Both Hawkshead Road and Hawkshead Lane have previously been known as Hawkshead Lane, Reeves Lane, Folly Lane, Jennings Lane, and Boltons Lane. Our archivist, Peter Miller, has researched the history of the cottages. North Mymms is rich in WWII history. The Outer London Defence Ring, set up to deter an invasion on the capital, runs through the south-east of the parish. Close to that line, and scattered elsewhere throughout North Mymms, are items of wartime archeological importance in the form of pillboxes, tank traps, gun emplacements, a Tett turret, and anti-tank trenches. The North Mymms History Project has attempted to map these historical sites as a permanent record of how the parish was fortified for the 1939 to 1945 war. A chance sighting of a familiar North Mymms landmark on an old map in Oxford’s Bodleian Library led researcher Anne Rowe to uncover some previously unrecorded history about the former gardens at Gobions. Anne’s find led her and historian Tom Williamson to piece together a fascinating insight into the gardens that once adorned the North Mymms estate. Anne and Tom have given the North Mymms History Project permission to reproduce their research on this site. In August 2018 work was completed on the restoration of a Grade II listed tomb in the churchyard at St Mary's church, North Mymms. The tomb, known locally as the Booth tomb, is the burial place of Mary Booth who died in 1807, and her husband Frederick Booth who died in 1831. Local historian and photographer Mike Allen has been researching the history of the tomb in his North Mymms Notes series. 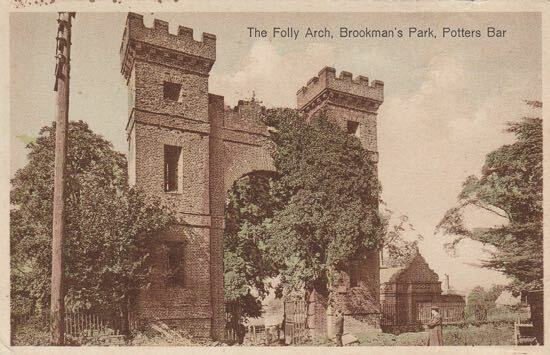 Folly Arch is attributed to the architect James Gibbs (although there is no direct evidence to support this), and was part of garden designer Charles Bridgeman's plans for Jeremy Sambrooke of Gobions. The arch is listed by Pevsner and the Historic England Grade II* listing as being built c1740. However, there is no definite way of dating the arch, and it is possible that the arch was constructed as early as the 1720s as it is known that the gardens were already well advanced in 1732 when Queen Caroline visited. At 10.35pm on Sunday 10 November 1946 a London-bound express train derailed about 200 yards south of the Dixons Hill Road bridge, Welham Green. The train had left Newcastle at 4.45pm on its way to King's Cross. It was made up of 12 carriages hauled by a type V.2 class engine and was travelling at about 55 mph. The entire train derailed, apart from the leading wheels of the engine. It remains the most deadly train disaster in the history of North Mymms, when a wheel on a north-bound train, travelling on a frosty Boxing Day evening in 1870, fractured sending carriages down the embankment at a railway crossing at Marshmoor, near Welham Green. Eight people died on that cold evening, including two local women - sisters-in-law - who were walking close to the line. Three people were injured. Had it not been for the curiosity of a four year old boy, walking with his dad through the churchyard of St Mary's North Mymms, this about 'Herby' may have never been told. But the inquisitive mind of the child, who wanted to know what was written on the headstones and the stories behind those buried in the graves, resulted in a father and son research project that uncovered a moving and tragic story of Victorian life and death. On Thursday, 21 May, 1942, Class A4 locomotive Number 4495 'Golden Fleece' arrived at Brookmans Park Station. On board was the Russian Peoples' Commissar for Foreign Affairs Vyacheslav Molotov, along with his staff. British Foreign Secretary, Anthony Eden, was there to meet his Russian counterpart. This wasn't a scheduled service; this was a special train laid on to carry a Russian delegation on route to attend a top-secret meeting, which would lead to the signing of the Anglo-Soviet Treaty. North Mymms has had its fair share of exposure in TV series and in feature films. Perhaps it's because of the proximity of the parish to the Elstree Studios, perhaps it's the mix of suitable locations, or perhaps it's both of these. The North Mymms History Project is compiling a list of the locations in the parish that have been used for filming. This will be a continually-updated feature as we research old and new scenes filmed around the parish. The last of Bell Bar's former coaching inns was reduced to rubble in October 2018, marking the end of an era for the once-thriving North Mymms community. In the 18th century, Bell Bar was an important staging post for those making the trip north from London. Located on the Great North Road, at the 17-mile point from central London, the hamlet of Bell Bar was approximately a day's journey from the capital by horse-drawn carriage. The North Mymms History Project has been comparing some of the old photographs in our archive with modern-day shots of the same scenes to show how the parish has changed. With more than 4,000 images to choose from, we can offer just a small sample in this feature, but we have added links at the end of the piece to other photographic features on the site for those who want to carry out their own research. North Mymms once had a thriving timber industry. Wood was grown and farmed as a felling crop on all the large estates in the parish. In one year alone, an "exceptionally wealthy" local landowner planted 40,000 oaks in a 27-acre field in Gobions. By the second half of the 19th century, an eighth of the land in North Mymms was being used to produce wood. Of the 4,966 acres that made up the parish, 633 (12.7%) were given over to timber. Mike Allen, one of the North Mymms History Project's team of four, has spent more than six years researching the stories of the 59 men from the parish of North Mymms who died while serving, or as a result of serving, in WWI. Mike started the project in 2012. In October 2018 the material was made available online for the first time, scheduled to coincide with the 100th anniversary of the end of the Great War of 1918-1918. During the two World Wars, serving members of the armed forces who were killed abroad were buried in Commonwealth War Cemeteries near to where they fell. Those who died in the UK were, in many cases, buried in their local cemeteries. Mike Allen has been researching the war graves of St Mary's, North Mymms. A collection of old photographs of North Mymms Park, thought to have been taken in 1876, has been discovered and shared with the North Mymms History Project. It's thought the images could be the earliest known photographs of the park, predating those held by Historic England. The images were loaned to the project by local resident Lindsay Sinclair and digitised for use on the site by Mike Allen. The text was written by Peter Miller. Almost 150 years ago, the journalist and writer James Greenwood disguised himself as a homeless person and walked the length of Hertfordshire in order to experience, first hand, what life was like for a tramp in Victorian England. He wrote about the fellow travellers he met on the way and the degrading conditions they faced. His journey took him through North Mymms. Stopping at the White Swan in Bell Bar he saw first-hand how confidence tricksters used their misfortune to try to eke out a living. A couple of family photographs of the Reverend Leonard Buxton, his wife Kathleen, and their six children have been acquired by a museum in Norfolk. The Rev Buxton was the vicar of St Mary’s, North Mymms from 1930 to 1944. The curator of the Cromer Museum has send digital copies of the images to the North Mymms History Project so that they can be shared on this site. The following is a reproduction of a series of articles about the historical aspects of the fabric of St Mary's church, North Mymms. They were written for the parish magazine by Patricia Cook, a former churchwarden, and were published intermittently during 2004 and 2005. The articles, which were later put on the St Mary's Church website in a feature entitled 'Know Your Church', are reproduced here with the permission of the church. 70 years ago a series of articles appeared in the North Mymms Parish Magazine about the history of St Mary’s Church. They were written by Harry Maynard Alderman, a local writer, historian, accomplished artist, carpenter, and parish councillor. In the 1940s and 1950s Mr Alderman was a frequent contributor to the parish magazine, writing serialised articles about St Mary’s church, including pieces about the history of the bells, the brasses, and the fabric of the church. New Zealand librarian and historian Rosie Bevan contacted the Brookmans Park Newsletter in an effort to find out more about her ancestors, the Knolles and Frowicks. The search let Rosie to St Mary's Church, North Mymms, where a tomb, stained glass windows, and brass memorials were discovered. Rosie then wrote a feature for this site about both families. Her researched has been enhanced with images of some of the information she discovered. Imagine if your first job depended on you making a promise that for, seven-years you wouldn't go to the pub, wouldn't play cards or dice, and would stay celibate. Tough rules back in 1818. This item appeared in the February 2003 edition of the former North Mymms Local History Society newsletter. There is no context surrounding the item, but it gives a fascinating insight into what it must have been like to qualify as a trades person during the reigns of George III and George IV. Beating The Bounds in August 1950 L-R: Pauline Speary, June Chuck, Dorothy Speary Image by D Denchfield digitally enhanced by Mike AllenBeating the bounds is an ancient custom still observed in some English and Welsh parishes. Under the name of the Gangdays the custom of going a-ganging was kept before the Norman Conquest. A group of old and young members of the community would walk the boundaries of the parish to share the knowledge of where they lay. Images of Bell Bar from the North Mymms Pictures From The Past book. This is one of 12 chapters listed here in the features pages. The book this chapter is taken from, contains more than 100 images which have been donated by local residents for a community project aimed at preserving the pictorial history of the parish. The book was published by the former North Mymms Local History Society in 2002. This site has downloaded 50 aerial images taken over North Mymms in the 1920s, '40s and '50s. They are from the Britain From Above project and show how the area has changed over the years. This collection shows what Bell Bar was like in 1947. The images in the slideshow are limited to 580px under the terms and conditions set out by the Britain From Above project, but they still offer an interesting perspective on the areas development. Close to a public footpath to the east of Woodside Lane and to the north of the Great North Road, lies a heap of concrete and metal. It appears to be the remains of a Tett turret, part of the WWII defences. Almost inline and to the west, at the side of Woodside Lane, are tank traps, part of the same wartime anti-invasion precautions. Brookmans, a sub-manor within North Mymms Manor, was originally called the Manor of Mimmshall, but later took its name for John Brokeman who held it at the beginning of the 15th century. After John died (c.1415), his widow, Elizabeth, inherited the manor and married John Chamberlyne. In 1666, Sir William Dudley and his wife Lady Mary, sold the whole of the Manor except Potterells, to Andrew Fountaine Esc. Of Solle, Nofolk. It is probable that he made the park and demolished the ‘old mansion’, if that had not already been done, but I can not think he would have demolished the new Manor house. He may have modified it. This is the chapter from the North Mymms Pictures From The Past book devoted to images of Brookmans Park. It is one of 12 chapters listed here in the features pages. The book this chapter is taken from, contains more than 100 images which have been donated by local residents for a community project aimed at preserving the pictorial history of the parish. The book was published by the former North Mymms Local History Society in 2002. This site has downloaded 50 aerial images taken over North Mymms in the 1920s, '40s and '50s. They are from the Britain From Above project and show how the area has changed over the years. This collection shows how what Brookmans Park looked like in 1928-29. The images in the slideshow are limited to 580px under the terms and conditions set out by the Britain From Above project, but they still offer an interesting perspective on the areas development. This site has downloaded 50 aerial images taken over North Mymms in the 1920s, '40s and '50s. They are from the Britain From Above project and show how the area has changed over the years. This collection shows how what Brookmans Park looked like in 1947. The images in the slideshow are limited to 580px under the terms and conditions set out by the Britain From Above project, but they still offer an interesting perspective on the areas development. This report was published by Richard Potter in October 2014. It offer a picture of the changing population and housing provision in Brookmans Park from 2001 to 2012. The report examines long-term trends as well as the characteristics of the current population. It also looks at households and housing, including information on house prices and earnings as well as changes in how people lived over the years. The document is shared with Richard's permission. The following is five-page pictorial record of the shops in Brookmans Park as they were in August 1994. All the names of proprietors are those who were responsible for the shops when the photographs were taken and not necessarily the current owners. Permission to reproduce the images online was given by the former North Mymms Local History Society (NMLHS). Hidden deep in the hedgerow on the north-east side of Brookmans Park is an almost perfectly preserved record of one of the local wartime defences. It's a spigot mortar emplacement and is where soldiers, possibly Local Defence Volunteers (later known as the Home Guard), would attach their spigot mortars (guns) and guard against possible enemy attack. The emplacement is so well hidden that it was totally missed by the Defence of Britain survey, carried out by the Council for British Archaeology in 2005. In this edition of North Mymms Notes, Mike Allen looks at the history of the Burns family of North Mymms Park, who had a large part to play in the development of the parish during the late 1800s and early 1900s. This latest issue (number 16) is reproduced on this site with Mike's permission. This feature has been edited and formatted for the web. In April 1989 Brookmans Park was selected to be one of several areas nationwide to trial domestic water metering. More than 1,000 local properties were chosen, joining 60,000 households around the country where water meters were also installed. The trial was to last three years. Home owners had no choice. There was no opt out. All households within the trial area were required, by law, to participate in the trial. In 1974 the owner of Fairview, a 140-year-old house on Welham Green's Station Road, wanted to demolish it and build two semis and two detached houses with garages. But North Mymms Parish Council took out a preservation order, the Department of the Environment agreed, and Fairview was saved. Now it is one of 10 Grade II listed buildings in the village protected from development. This is the chapter from the North Mymms Pictures From The Past book that farming in the parish over the years. It's one of 12 chapters listed here in the features pages. The book this chapter is taken from, contains more than 100 images which have been donated by local residents for a community project aimed at preserving the pictorial history of the parish. The book was published by the former North Mymms Local History Society in 2002. In 1940, as the German army swept across mainland Europe to the shores of France, Britain was in imminent danger of invasion. Only the channel stood in the enemy's way and, beyond that, a line of ditches, concrete and brick. This line passed through the southern part of Hertfordshire, from Watford to Cheshunt, and much of it still remains today. Former local resident, Jim Apps, has researched the history of what he calls "Fortress Hertfordshire". In the mid 1700s a register was kept of the nursing mothers who were prepared to feed and nourish unwanted babies from the Foundling Hospital in London. In North Mymms, South Mimms, London Colney, St Albans, and Hatfield, there were a total of 80 women named. Six lived in North Mymms and four in South Mimms, with three in Colney Heath. This a feature by Merle G. Rafferty, first published Hertfordshire Countryside magazine in August 1972 and inspired by a search through old parish magazines from St, Mary's Church, North Mymms. During the research, Merle pieced together 'a jigsaw' of information that had been recorded over many years. We have a photocopy of the original article, which we have transcribed. The original article is embedded in the piece. Local photographer and historian Mike Allen from Welham Green has been busy collecting and curating almost 4,000 old images of North Mymms. 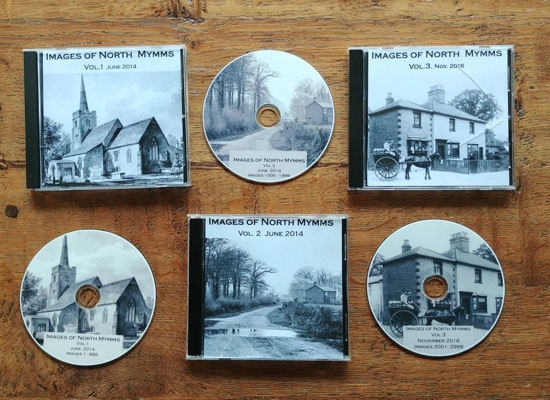 With the help of fellow historian, Peter Miller, Mike has produced four CDs containing their "Images Of North Mymms. Some were donated by local residents, others were rescued from old collections that had not been viewed for years. Thanks to Mike and Peter, these images are available for all to enjoy. This is the chapter from the North Mymms Pictures From The Past book that covers some of the landmarks in the parish. It's one of 12 chapters listed here in the features pages. The book this chapter is taken from, contains more than 100 images which have been donated by local residents for a community project aimed at preserving the pictorial history of the parish. The book was published by the former North Mymms Local History Society in 2002. This is the chapter about Little Heath, taken from the North Mymms Pictures From The Past book. It's one of 12 chapters listed here in the features pages. The book this chapter is taken from, contains more than 100 images which have been donated by local residents for a community project aimed at preserving the pictorial history of the parish. The book was published by the former North Mymms Local History Society in 2002. Half a century ago, Dorothy Colville, local teacher and historian, wrote an article entitled 'A plea for tombstones', published in the Hertfordshire Countryside magazine in September 1969. The North Mymms History Project has reproduced the feature, and embedded a copy of the original piece at the foot of the page. We have also added some recent images of the tombstones which Dorothy wrote about to show how they have aged over the last 50 years. The North Mymms History Project has produced a number of maps to help illustrate some of the historical and geographical features on the site. All the maps below have been created using Google Maps, and include data compiled by the project, or data freely available via various open data programmes. In this articles in Mike Allen's series of North Mymms Notes he looks at the history of the mason marks that have been etched in the stairs leading to the tower at St Mary's Church, North Mymms. Mike has researched why they were made, what they stand for, and why so little is known about the men who helped build the parish church. This is the chapter about Marshmoor, taken from the North Mymms Pictures From The Past book. It's one of 12 chapters listed here in the features pages. The book this chapter is taken from, contains more than 100 images which have been donated by local residents for a community project aimed at preserving the pictorial history of the parish. The book was published by the former North Mymms Local History Society in 2002. A WWI prisoner of war (POW) camp in North Mymms, built by the inmates themselves in 1916, and housing 210 captives, was, it's claimed, used as a source of cheap labour for the local timber industry, with interns being paid 1d (the equivalent of about 20p in 2018) an hour. Local historian, Mike Allen, has been researching the Marshmoor WWI POWs and finding out about the lives of the prisoners. He's illustrated the piece (below) with images from the Images of North Mymms collection. Local historian and archivist, Peter Miller, researches the North Mimms Rifle Range. He discovers that there are no known surviving archaeological remains of the range, and writes that: "following extensive searches, the only evidence for its location is a postcard view of South Lodge, North Mymms Park, which shows a flagpole, notice board and warning sign indicating that the rifle range was within North Mymms Park. Why is North Mymms spelt with a ‘y’ and South Mimms with an ‘i’. Until the 19th century, scribes treated the letters ‘i’ and ‘y’ indifferently, spelling the same word, sometimes with ‘y’ and at other times with ‘i’; even on occasions in the same document. For example; in the Probate Register copy of the will of John Coningesbye, dated 1543, we find the word ‘sisters’ spelt with ‘i’, and three lines down it is spelt with ‘y’, ‘systers’. The following are images of coaches that served North Mymms over the years. In particular, during the '50s, '60s, and '70s. The images were taken by the late Ron Kingdon except for the last picture taken in 1927 by L Maxwell. They are from the North Mymms Images Collection, which have been shared with this site. All have been digitised and enhanced by local historian and photographer, Mike Allen, and are available for sale on a set of four CDs. The following slideshow is made up of pictures from the Images of North Mymms collection recording the history of the area. This selection depicts the various delivery and collection services from 1900 onwards. Click on the square button below the slideshow to view full screen (recommended). Below the slideshow is a newspaper article (courtesy of local historian Mike Allen) about local milkman John Swain being voted Milkman Of The Year 1986. The images in this gallery were collected by the former North Mymms Local History Society (NMLHS) and B. H. Warne. They have been digitally enhanced by local historian and photographer Mike Allen. Three are part of the Images of North Mymms collection and three part of the Peter Miller collection. The original images were taken by Hunting Aerosurveys Ltd (Associated with Aerofilms Ltd). Both companies no longer exist. These aerial photographs were taken over North Mymms in September and October 2002. The images include shots of Water End, Hawkshead Lane, the Royal Veterinary College (RVC), Brookmans Park, Chancellor's School, Brookmans Park Primary School, and the Brookmans Park Transmitting Station. The photographs below were taken by local resident Paul Large of Falcon Media. This is the chapter from the North Mymms Pictures From The Past book devoted to images of North Mymms Park, the War Memorial and St Mary's Church. It is one of 12 chapters listed here in the features pages. The book this chapter is taken from, contains more than 100 images which have been donated by local residents for a community project aimed at preserving the pictorial history of the parish. The book was published by the former North Mymms Local History Society in 2002. In this parish, most properties seem to retain the name of an early owner, but not necessarily the earliest, although why one particular owner’s name is retained it is not possible to say. For example, Gobions took and kept the name from William Gobion, who held the property in 1391, whilst Brookmans Manor took the name from John Brokeman, but only some time after his death in 1415. Before that it was the ‘Manor of Mimeshall’. The names of the following two very dissimilar properties are interesting. During renovations to a cottage in Huggins Lane, Welham Green, a builder came across a time capsule of historical treasures jammed behind a cupboard. It was as he moved the wood away from the wall that the items began spilling out of a cavity. Among the pens and papers was a dusty and sooty copy of the monthly magazine, ‘The Illustrated Carpenter & Builder’, dating back to August 15, 1930 with an article written by H.M Alderman. This is the chapter from the North Mymms Pictures From The Past book devoted to images of some of the characters who have lived in the parish over the years. It is one of 12 chapters listed here in the features pages. The book this chapter is taken from, contains more than 100 images which have been donated by local residents for a community project aimed at preserving the pictorial history of the parish. The book was published by the former North Mymms Local History Society in 2002. There are 13 post boxes in the parish of North Mymms, one dating back to Victorian times. The North Mymms History Project has mapped and photographed those still in service in May 2018. This feature was written to complement our item (below) looking at postal services in North Mymms over the years. Potterells was once one of the great manors of North Mymms. During World War II some of its outbuildings were used to make small arms, and in 1965 it was sold and left empty, gradually becoming derelict. The last pictures of Potterells, taken in the early 80s, are of a ruin shortly before it crumbled into a heap of rubble. This feature by John Brushe, looks at the history of Potterells and includes some fascinating illustrations of the manor in its heyday. This is the chapter from the North Mymms Pictures From The Past book containing images of public houses in the parish. It's one of 12 chapters listed here in the features pages. The book contains more than 100 images which have been donated by local residents for a community project aimed at preserving the pictorial history of the parish. The book was published by the former North Mymms Local History Society in 2002. In early 1985 the bells at St Mary's, North Mymms, were lowered from the belfry that most had occupied for almost 180 years. The oak frame which had been supporting them had begun to rot. Woodworm had damaged the beams which, it was thought, were second-hand when installed, and which had originally been used in an old warship. The old oak had been supporting a peal of eight bells weighing a total of almost three tons. The parochial church council (PCC) feared the frame might collapse, causing damage to the 800-year-old tower. So an extensive refurbishment plan was put in action costing an estimated £20,000 pounds. A feature, written by the late Bill Killick for the November 2000 edition of the former North Mymms Local History Society Newsletter. It references a private Act Of Parliament set up "to ascertain, establish and confirm the boundaries of the manors and parishes of North Mimms and Northaw, so far as the same extends to and upon the several Commons called North Mimms and Northaw Common in the County of Hertford". You might have passed them in the car, by train, or on foot, and you probably won't have given them a second glance. But if you had travelled the same way 130 years earlier, you might have found queues of people, many with carts loaded with coal, wine, clothing and food, haggling with the taxman. They are the coal tax posts, many of which were erected following the Coal Duties Act of 1851, and, thanks to them, many of the bridges across the Thames were paid for. Straw plaiting had been carried on in England from Elizabethan times, but with straw imported from Italy. During the Napoleonic wars, in the early 1800s, the straw plaiting industry increased in England owing to the blockade, and English straw had to be used instead of Italian. Jenny Rackstraw writes that a great deal of straw plaiting was done in North Mymms parish, as shown by the 1851 Census records. It took a century of campaigning by local residents, but finally, on Monday 29 September 1986, the first passenger train departed from Welham Green station. The call for a station started with a petition in 1886, and culminated, 100 years later, with the official opening of Welham Green station close to the old Marshmoor sidings. Local historians and photographers Mike Allen and Ron Kingdon recorded events. In this piece the late John Harris of the former North Mymms Local History Society traces the history of the Casamajor family in North Mymms. The Casamajors were a family of Spanish origin, claiming descent from the royal house of Cadiz. They had settled in Bristol and founded the English branch of the family by the late 18th century. They inherited Potterells, which included an estate of 200 acres, he sold High Cannons in Shenley and set about restoring the house at Potterells. He became High Sheriff of Herts in 1800, and died in 1820, aged 73. A series of images showing how the village of Brookmans Park has changed over the years. They are from a collection of pictures has been curated and digitised by local historian and photographer, Mike Allen. The images, a mix of photographs and old postcards, are from the Images Of North Mymms project, which has gathered almost 4,000 images of the parish and made them available online. This site is featuring many of these images and trying to piece together the stories behind the pictures. This piece, which looks at the influence of the East India Company (EIC) on North Mymms, was written by local historian Peter Kingsford . It's the second piece on this site about the EIC. The other, entitled, The East India Company's impact on North Mymms 1757-1857 by Chris Jeppersen, looks at the sources of the wealth that EIC involvement brought to the area, and explores the connection between exploitation and slavery. Canadian Richard Gillians traced his family tree back to North Mymms. He writes: "It appears that my family lived in the Roestock area of North Mymms from at least the time of the first census of 1841 and were generally in the employ of the Gaussen family as farm labourers. For example in the 1851 census, I found my 3 times grandfather living with his son John and family at Roestock Lane. It could be possible that my relative John was on site at the time of the fire at Brookmans. The following pictures were reproduced from glass slides belonging to the Potters Bar & District Historical Society. They were donated to the North Mymms Local History Society (NMLHS) which offered them to this site to reproduce online so that more people could enjoy them. The captions are exactly as they appear on the original glass slides. Some of the pictures already appear elsewhere on this site. The author of this article, Mark Grantham, is a direct descendant of Valentine Grantham and Elizabeth Halse. Valentine’s daughter Mary Grantham is the subject of chapter 24 of Dorothy Colville’s book, 'North Mymms Parish and People', reproduced on this site, which tells the story of 'The Pretty American'. Mark's research is followed by two related features from this site's history archive. Because the section of the road between Shepherds Way junction and Hatfield was diverted to a new route in 1850, by - passing Bell Bar, the simplest way to explain the original route is to describe a journey along the road through the parish shortly after 1730: "Travelling north from Potters Bar, we cross the Parish and County boundary into Little Heath, a small part of which is unenclosed, where stands the Turnpike at which a toll must be paid." The Hertfordshire County Open Speed Trials 1911 began in Bell Bar, North Mymms, and continued along The Great North Road, the A1000. The late Marian Benton, archivist of the former North Mymms Local History Society compiled this report using a cutting taken from MotorCycle magazine at the time. This piece also includes an original photograph taken at the time and used in the magazine. For more than 150 years, the Chuck family supplied the homes of North Mymms with bread, eventually closing their baking business in 1962. According to local resident, photographer and local history enthusiast, Mike Allen, the reason the bakery closed was due to "the price of coal and not modernising the ovens" as well as the added pressure of running the local post office. In June 1998, a community website for Brookmans Park and the parish of North Mymms was launched. It provided a focal point for local information and debate for 20 years. This is the story of a news site and local discussion forum that won national awards and commendations for its service to the community. All the local history information from the site was moved this site, The North Mymms History Project, and all the walks to The Hertfordshire Walker. In 1756, Bell Bar was a bustling staging post on the Great North Road, with four inns and alehouses dotted around the hamlet. The route was one of the main thoroughfares for travellers on horseback or on stage coaches making their way between London and the north. Situated 17 miles from the capital, it was the ideal spot to break the journey, stay the night, feed or change the horses, and have a few beers and a meal. Local historian and photographer, Mike Allen reports about a religious sundial that dates back to 1584 and which was found on the wall of St Mary's parish church, North Mymms. It was by clergy and parishioners to check the time of services. As the sun crossed the sky, its shadow would be marked by a central rod known as a gnomon. Etchings in the stonework of the church wall would show when services (masses) were to take place. The dial has been damaged and the rod now missing. There is a sedilla, a piscina, and a holy water stoup, but was there ever a rood and rood screen, and were there medieval paintings on the walls? Local historian Mike Allen has been researching some of the historical mysteries and curios at St Mary's church, North Mymms. Mike's two documents, 'Medieval Mysteries' and 'Medieveal Curios' are now combined in this feature. In 1086, North Mymms, formerly known as Mimmine, was surveyed by assessors following an order by the king, William the Conqueror. The king wanted a record of how land was distributed (who owned what), and to work out what taxes were due to the Crown. It was to be a detailed survey, listing not only every piece of land, but also every person, and every farm animal, "not even an ox, nor a cow, nor a swine was there left, that was not set down in his writ". The document containing this information was known as the Domesday Book. Another in Mike Allen's series of 'North Mymms Notes' in which he researches the stories behind the images he has curated for his 'Images of North Mymms' project. This time it's the story of the Holloways of Welham Green. The photograph above apparently shows Mr and Mrs Holloway outside their house in Station Road, now numbers 50 and 52. It's said they ran a sweet shop and, according to Mike's research, it's thought Holloways Lane is named after them. The following text was written for a geological walk around North Mymms in October 2004. It's been included in the North Mymms History Project because of its natural historical value. The piece focuses on the swallow holes and water courses in the area. This site thanks Mike Howgate M.Sc for giving us permission to reproduce his work on this site. Cross the railway bridge at Brookmans Park, walk north on Station Road then turn left down Bradmore Lane, and there, hidden in undergrowth, you will see what is left of a line of concrete blocks on both sides of the lane. They are part of a network of thousands of obstacles put in place during WWII in order to prevent German tanks rolling through the British countryside. The tank traps have been moved several times but efforts are underway to try to ensure they are listed and preserved. A Canadian veteran of the 1939-1945 war, Richard Gillians, wrote to the former Brookmans Park Newsletter and asked whether a page could be made listing the names of the North Mymms men who died in both wars. Richard, whose grandfather was a local man, also wanted photographs of the war memorial including for the benefit of those living overseas. This feature is taken from the newsletter's news archive. 'Moffats Lane', 'Moffats Farmhouse' and the house called 'Moffats', all perpetuate the name of a family who held property in the parish at the end of the 16th century, but of whom little is known. Unfortunately, although in 1538, all parishes were instructed to record baptisms, marriages and burials, the only early such record for North Mymms that has survived covers the period 15th August 1565 to 26th March 1568. In this there are two entries which I think refer to the Moffat family. In 1891, as fire swept through and eventually destroyed Brookmans, a large country house standing in grounds that now make up much of the golf course, staff tried to rescue as much as possible from the mansion that gave its name to Brookmans Park. Some valuables were saved, but much was lost. Now, thanks to research by this site's resident historian and archivist, Peter Miller, some of those paintings, which were presumed to have been destroyed, have been traced - to Australia. A school for the girls of the parish and for the infant boys until 1926, stood at Water End from 1847 to 1960. The accommodation was for 130 pupils so that during those 113 years of social change thousands of children passed through the school. What kind of influences did they come under? These sprang from three things; the school’s origin, its location and the narrow range of occupations available; the chief being domestic service. This is the chapter from the North Mymms Pictures From The Past book devoted to old images of various forms of transport in the parish over the years. It is one of 12 chapters listed here in the features pages. The book contains more than 100 images which have been donated by local residents for a community project aimed at preserving the pictorial history of the parish. The book was published by the former North Mymms Local History Society in 2002. In this piece, Sonia Addis-Smith nee Porter traces her family tree back to Hawkshead House, North Mymms through letters she discovered which recorded life in the parish between 1858 and 1864. Many of the letters Sonia found were to and from family members who had settled in New Zealand. One tells of the day her father was shot in the chest and eye while hunting but survived to hunt another day. The story, told by retired Australian journalist Eric Shackles, of the little girl who lived at Moffats Farm on Moffats Lane, Brookmans Park, North Mymms, and who was frightened of spiders. Eric has been researching whether the poem, Little Miss Muffet, was actually written about a local girl. He concludes that it was and includes variations of the poem, and some fascinating stories about how the story developed over the years. This is the chapter from the North Mymms Pictures From The Past book containing images of Water End. It's one of 12 chapters listed here in the features pages. The book contains more than 100 images which have been donated by local residents for a community project aimed at preserving the pictorial history of the parish. The book was published by the former North Mymms Local History Society in 2002. Another the chapter from the North Mymms Pictures From The Past book devoted to old images of Welham Green, taken over the years. It is one of 12 chapters listed here in the features pages. The book contains more than 100 images which have been donated by local residents for a community project aimed at preserving the pictorial history of the parish. The book was published by the former North Mymms Local History Society in 2002. This site has downloaded 50 aerial images taken over North Mymms in the 1920s, '40s and '50s. They are from the Britain From Above project and show how the area has changed over the years. This collection shows how Welham Green has developed since 1947-54. The images in the slideshow are limited to 580px under the terms and conditions set out by the Britain From Above project, but they still offer an interesting perspective on the areas development. In 1911, fewer than a quarter of the 404 homes in North Mymms had a constant mains water supply piped to the premises. The rest had to rely on an estimated 53 active wells dotted around the parish. A health inspector's report at the time noted that the water extracted from the wells was "sufficient in quantity and good in quality". Four of those wells were still supplying water for 20 homes more than half a century later, but, by then, the quality was described as only "satisfactory". Built in the late 17th or early 18th century, The Woodman Inn at Water End is a Grade II listed building with an interesting history. Local resident, historian, and photographer, Mike Allen, has traced the pub's past in this latest issue (number 20) of his North Mymms Notes, reproduced on this site with his permission. In the 780 years since the first priest conducted a service at St Mary's, North Mymms, there have been 57 men and, more recently women, serving in the role. The average time in the post is almost 14 years. Mike Allen, one of those behind the North Mymms History Project has researched the history of the priests, or vicars as they were later known, of St Mary's church, North Mymms. A tomb in the churchyard at St Mary's, North Mymms, which was listed as a Grade II historical monument in 1983, is now completely covered in ivy. It's not known whether any damage has been caused, but church representatives are to meet to consider how best to tackle the problem. Earlier this month the restoration of another listed tomb in the churchyard was completed. That repair cost several thousand pounds and took two years. The following is a selection of images of the flooding of Mimmshall Brook that took place in the early hours of Monday October 30, 2000. It followed weather conditions described as the worst to hit the south of England since the storms of 1987. Some residents moved into upstairs rooms, others left the area to stay with friends and relatives. Swanland Road was flooded from the ford at Mimms Hall Cottages at the south end through to Warrengate Road which in turn was flooded the full length to the cottages at Water End. In July, 2000, the North Mymms Residents’ Association (NMRA) folded. It had served the local community since 1929, with a short break for the war. The decision to close was taken following a fall in membership and a lack of interest. The final meeting attracted just four people, including officials. News of the closure was covered on the former Brookmans Park Newsletter, that article is embedded below. This piece below was written by local historian and archivist, Peter Miller, as part of the North Mymms District Green Belt Society's opposition to the development of Swan Lodge into flats. The item embedded in the article is from the old Brookmans Park Newsletters news pages, copied to this site as part of our news archive. Brookmans Park only bank closed in 2000. The Lloyds bank opened in the 1950s, but closed as the renamed Lloyds TSB on Friday 14 April, 2000, despite a campaign by locals to keep it open. The bank blamed a "drop in footfall" for the closure, although more than 300 local people signed a petition to try to keep the bank open. The village used to have a branch of the Abbey National building society, which closed in the 1970s. On Sunday, February 23, 2003, a team of 17 volunteers turned out to plant an avenue of oak, alder and holly in Gobions to mark the millennium. Click here for the story. The trees, six oak, four alder and six holly now form an avenue running north to south across the upper Leach Field. According to a spokesperson for Gobions Woodland Trust, the oak trees were chosen because they provide an excellent habitat for insects, which in turn provide a valuable source of food for the local bird life. The following is a selection of photographs from the visit by Her Majesty The Queen and Prince Philip to the Hawkshead Campus of the The Royal Veterinary College (RVC). The day featured the official opening of the new Larger-Animals Clinical Centre and the "Eclipse" Building. This feature was put together by John Fisher the former site manager of the RVC. John also took all the photographs recording the event. In 1998, five local women spent an hour a week from April 22 to September 18 walking through Gobions Wood recording the butterflies they saw. Their work resulted in a detailed report which was submitted to the National Millennium Butterfly Atlas Survey. A year later they did it all over again. Below are images of the butterflies they saw in both 1998 and 1999, and, below those, the reports containing the information gathered. This report, first published on the former Brookmans Park Newsletter, now the North Mymms Newsletter, in August 2002, features 49 species of flowering herbs and shrubs (flowers, bushes and trees) seen during a short survey from Gobions Open Space car park through Gobions Woodland and back in April 2002. Illustrations have been added to the text submitted by Brenda Harold's WEA class, which carried out the survey. This report, first published on The Brookmans Park Newsletter in August 2002, features 49 species of flowering herbs and shrubs (flowers, bushes and trees) seen during a short survey from Gobions Open Space car park through Gobions Wood and back in April 2002. Illustrations have been added to the text submitted by Brenda Harold's WEA class, which carried out the survey. Gobions Wood in Brookmans Park, North Mymms is one of the best sites in Hertfordshire for fungi, according to the late Michael Jonas, one of the trustees responsible for the former Gobions Woodland Trust. But, in his report published in 1998 he wrote: "because some fungi are poisonous for humans to eat and perhaps also because they seem to appear overnight, they receive a bad press." The following information about bird numbers in North Mymms has been researched and produced by local ornithologist Rupert Pyrah. The information was first published in the now closed environment section of the former Brookmans Park Newsletter, now the North Mymms Newsletter. The material is being archived on this site as part of our natural history section.